Pistachio Pesto is an interesting variation on the Classic Basil Pesto and can be used interchangeably in recipes. The pistachios add a subtle, pleasant flavor of their own. Serve it over pasta or use in any recipe which specifies a basil pesto. 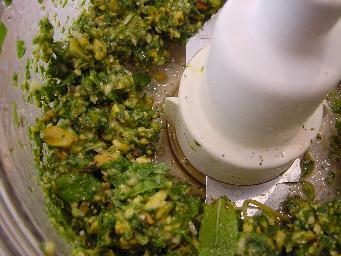 Combine the basil, garlic, cheese, and pistachio nuts in a food processor or blender. Process to mix. With the machine running, slowly add the olive oil. Season, to taste with salt and freshly ground pepper and process to the desired consistency. for alternate recipe "Grilled Baby Eggplants with Pistachio Pesto"